This is a premium Border Patrol style duty belt. Its double buckle fastening system provides a firm foundation. 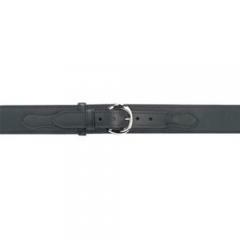 The Border Patrol style buckle fastens the 1.25" wide exterior belt tip. Standard 1.25" and 2.25" keepers hold the interior and exterior belt tips in place. The Safariland 146 is designed to be used in conjunction with one of Safariland's 1.50" or 1.75" Garrison belts and keepers. The 146 is available in plain, basket, gloss or nylon-look finish. Great duty belt. Rugged and functional. I have been wearing the belt for two weeks so far I would recommend it. Great quality and so far appears durable. I have several officers that want to purchase this item. I would recommend it. Looks great, however the stitching was loose and not completed. Run small had to exchange for next size up. Very good. 5 out of 5. There is nothing wrong with the style of the belt however it gave me bad back pains. And I have to return it. How is the sizing on this? I normally wear a 34-35 in a pants belt. When selecting your size, choose your actual waist size.